The Browns Range site. Image: Northern Minerals. 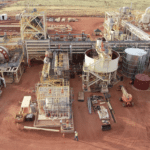 Northern Minerals is making “steady progress” on the pilot plant installation at the Browns Range heavy rare earths project in Western Australia, with construction on track for completion by June 30. Contractor Primero Group is progressing installation of process plant modules and mechanical equipment, according to Northern Minerals. It reported that electrical and piping installation works continue to progress well in both the beneficiation and hydrometallurgical plants. 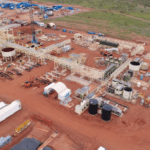 “To facilitate commissioning of the next stage of the process flowsheet, completion of all construction activities in the beneficiation plant remains the focus,” Northern Minerals stated in an ASX announcement. Northern Minerals added that preparations for commissioning of the next section of the process plant are nearing completion; this will include magnetic separation, flotation and tailings. The recruitment process for Browns Range also continues. Process operator roles are being filled, while most of the professional, technical and management roles are already filled, according to Northern Minerals.